Pumpkin contains a wealth of antioxidants, the most notable being beta carotene. The beta carotene is what gives this delicious squash its vibrant color. Once in your body, this vital nutrient is converted into Vitamin A. Numerous studies reveal that this essential antioxidant plays a key role in reducing degenerative diseases such as heart disease, some types of cancer, and arthritis. Plus, pumpkin does not contain any fat. It is perfect for those wanting to lose or maintain their weight. Who doesn't love a NO FAT food? It's low in calories. As a plant-based food source, calorie counting is not a concern when enjoying this tasty delight. You can fill yourself up with minimal calories. Nice. The high potassium content found in pumpkins helps regulate your heart beat, reduce muscle cramping, and keep your musculoskeletal system operating at optimal levels. Enough for the nutrition information...let's get down to using this delectable food. This recipe relies on the natural taste of spices and the sweetness of pumpkin instead of heavy refined sugars. Most commercially prepared or online recipes, you will notice, use an inordinate amount of sugar. Not mine. You will receive the pure, natural taste of ingredients. My tasty recipe only uses minimal refined sugar. And, you could easily substitute unsweetened apple or white grape juice for the white and brown sugars. Of course, you can add more sugar as you like. Use it as a topping over ice cream, muffins, rolls and croissants. Use it in your sandwich. 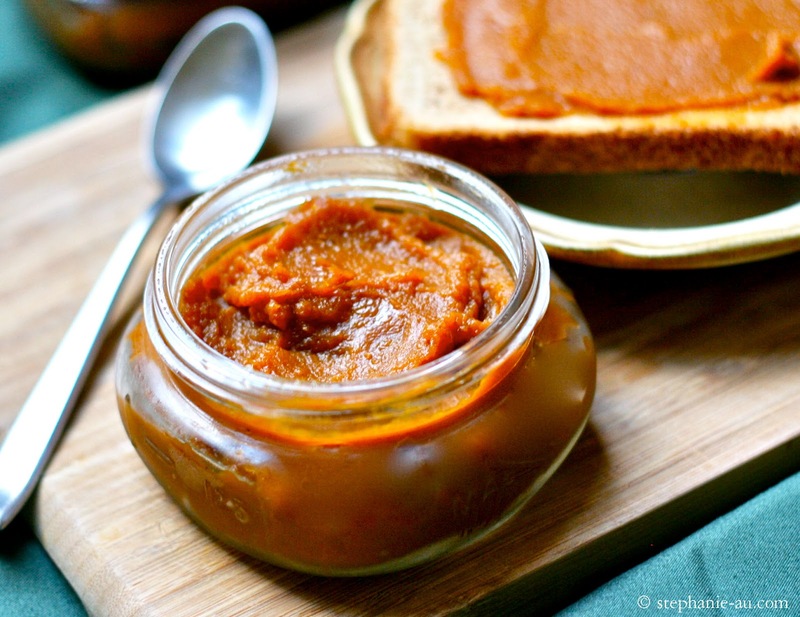 Instead of traditional jelly or jam, substitute some pumpkin butter. You'll increase the nutritional value and may find the taste addicting. Jar some and give as gifts. Everyone loves homemade items, especially as holiday gifts. After making a batch, remove it from the heat and let it cool. Place the pumpkin butter into your favorite jar. Secure tightly. Label it and present it as a gift. Use in recipes instead of pure pumpkin. Most baked goods recipes call for pumpkin, cinnamon and spices. That is exactly what pumpkin butter is. Save yourself the time and effort of mixing individual ingredients. These are some ideas, and uses, that work particularly well to highlight the versatility of pumpkin butter. Can you think of any others?